As we've discussed numerous times on this blog, we believe that home should become the location for much more of the care delivery provided by the US healthcare system. This is especially true as it relates to the elderly for whom travel is difficult and who are more susceptible to get a cold or infection in a clinic or hospital. So the future of care as we see it requires more care delivery in the home and the community. This creates jobs and also creates cost, but the key is to more than offset those costs by reducing the cost of care. We've seen that this is possible when focused inexpensive care is applied to expensive populations. For more proof of this, read this article inspired by the research and writing of Atul Gawande. In this rendering, a home care caregiving job becomes a first step in a progression and a big one, moving an individual from unemployed to having a job as a non-medical caregiver, providing companion, cleaning and assistance with activities of daily living. This is not a high paying job but a caregiver can earn over $20K per year and possibly much more. For caregivers with good reading and writing skills (or the ambition to develop them) and a good work ethic, they can move up to a higher skilled and higher paying job. 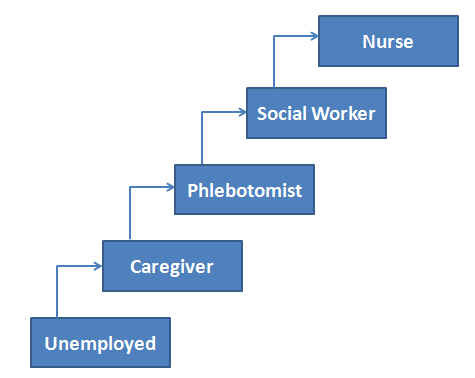 The diagram depicts a phlebotomist (a person trained at taking blood samples), but there are other potential roles as well, such as becoming a certified nurses assistant (CNA), a home care scheduler/supervisor, or a job monitoring telehealth results or working as a health coach in a call center. These are the types of jobs that will be created as part of health care reform that will reduce overall health care costs. Further progression can include a step up to a social worker role or a nursing role that requires a degree or specialized training. All of this will require a better ability to coordinate the delivery of care, and this is what Ankota is focused on delivering. If your organization has the ambition to improve care, create jobs and lower costs, but the technology to manage care coordination is a challenge, we'd love to help.